Tisbury selectmen say ferry service causes shoaling in the harbor, but SSA says last survey didn’t show a need to dredge. Tisbury and the Steamship Authority appear to be on a collision course about dredging Vineyard Harbor. Israel said he found the statement about losing money ironic, given all the construction in Woods Hole on a new terminal. The board voted unanimously to draft a letter to the SSA asking for help with dredging the area surrounding the slips in Vineyard Haven Harbor. 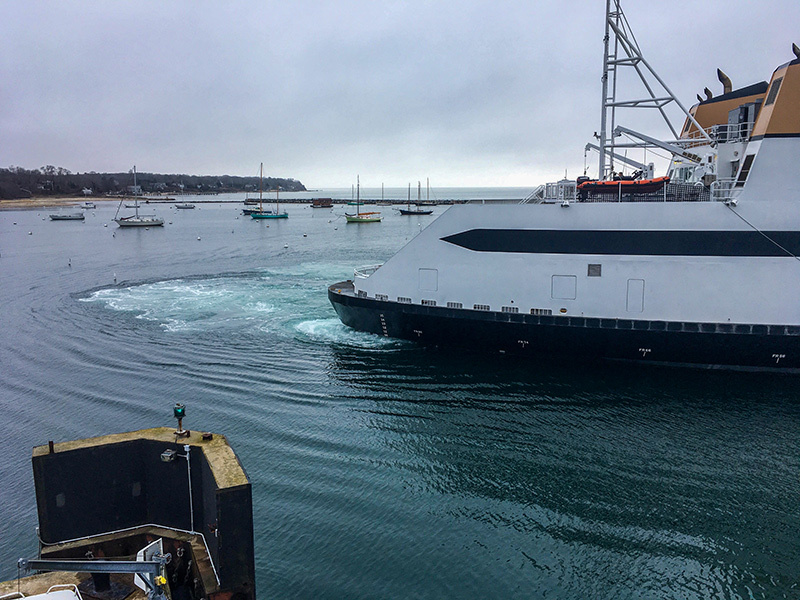 It took a few days, but SSA spokesman Sean Driscoll responded to a request for comment, saying the Steamship Authority is in the process of setting up a meeting with Tisbury officials. Crocker confirmed that Israel quoted him accurately. He said his discussion was with Mark Rozum, the SSA’s operations manager. Driscoll’s next statement in his email is likely to get significant pushback when town and SSA do meet. “Additionally, I will note that the Town of Tisbury receives approximately $250,000 a year in embarkation fees, and that situations such as these are ones that the state embarkation fee statute was designed to address,” Driscoll wrote. “The embarkation fee statute specifically states ‘[a]ny city or town which receives monies from this section shall deposit them in a special fund, to be solely appropriated for the purpose of mitigating the impacts of ferry service on the city or town. Monies deposited may be appropriated for services including, but not limited to, providing harbor services, public safety protection, emergency services, or infrastructure improvements within and around the harbor of any city or town which receives monies from this section.’” Embarkation money comes from a 50 cent surcharge on passenger tickets. The town already does set money aside for dredging, and on Tuesday, town meeting voters will decide whether to set aside $100,000 in the coming fiscal year for dredging. Other portions of the funds go toward things like paying for officers to direct traffic coming and going from the SSA terminal. In a follow-up interview, Israel was upset with that response from the SSA. “It’s not up to them how we spend our embarkation funding,” he said, noting that this has been an issue periodically through the years. While the original legislation was rigid, the final wording allows the town to spend those funds on things it can link back to the harbor. “We spend $55,000 per year for patrolmen to watch the traffic leaving the SSA. That benefits the SSA,” Israel said. So That means they should have another $200,000 for dredging… and traffic cops benefit the nightmare that is downtown VH. The woods hole grounded because it was in a part of the harbor it wasn’t supposed to be. Islanders have been dumping a lot of hate at the ssa lately and i haven’t had an issue with them since last year. This is a VH money grab thats not going to go anywhere. If you are on deck and looking down when a ferry comes in to the slip, you’ll notice how the propwash from slowing the boat “dredges” the slip area and pushes sand elsewhere in the harbor. And if that’s the sand that’s the problem for Tisbury, then shouldn’t the SSA help to solve a problem they’ve created? Obvious solution: if ferry prop wash is causing a problem, stop ferry service. Commercial vessels have right of way in channels. Last I read, the moorings of two private vessels restricted maneuvering in the channel, requiring ferries to leave the channel in certain wind conditions. If those two private vessels are still infringing, that suggests the private owners and those who permitted the moorings responsible for the dredging. Colregs dictate right of way, commercial has nothing to do with it. US calls it rules of the road, but neither have anything to do with this. VH harbormaster sure does if he is permitting vessels to large for their ball. VH already receives the money to solve these issues. If they don’t spent it wisely then ditch the fee and give it to someone who can manage the money better. Maybe check what the Coast Guard says about large vessels in narrow channels and fairways. As for the harbormaster, I didn’t mention because I didn’t want to panic taxpayers.